백자 청화투각모란당초문 항아리(白磁 靑畵透刻牡丹唐草文 立壺)는 조선시대 몸체를 뚫을새김한 높이 26.7㎝, 아가리 지름 14.25㎝의 백자 항아리이다. 반듯한 아가리에 어깨에서부터 급히 벌어졌다가 서서히 좁아진 모습으로 내·외의 이중구조로 되어 있다. 안쪽 항아리는 문양이 없으며, 바깥 항아리는 표면을 뚫어서 조각하는 기법으로, 몸체 전면에 활짝 핀 모란과 줄기와 잎을 표현하였다. 어깨부분에는 청화로 덩굴무늬를, 허리 밑부분에는 꽃무늬 띠를 도들새김하였다. 원래 꽃병으로 만들었던 것으로 보이며, 바깥 항아리는 일반적인 조선 항아리가 지니는 전형적인 곡선이 있다. 항아리 전체에 새긴 모란꽃은 사실적으로 표현되었다. 전체 형태는 대범하면서도 은근한 세련미를 풍긴다. 유약은 담청을 머금은 백자유로, 18세기 후반부터 시작되는 경기도 광주에 있는 가마에서 생산된 것으로 추정된다. 필통들에 다양하게 뚫을새김한 모란무늬나 물결무늬들로 미루어 18세기 후반의 작품으로 짐작된다. This Blue and White Porcelain Jar (26.7cm height, 14.25cm top diameter) has a two-ply structure in the shape of upright flare and broad shoulders, narrowing down the base. The inner one does not have any kind of patterns or designs, while the outer one has peony with leaves in full bloom, stems and bines, sculptured through the whole surface of it. On the upper part of the shoulder, this jar has a band in underglaze cobalt blue with simple designs on it, and at the base just below the waist is a bold relief carving of flower buds. The shape indicates that it’s originally intended for use as a flower vase. The outside ware forms the curve following the typical pattern of the Joseon Dynasty. 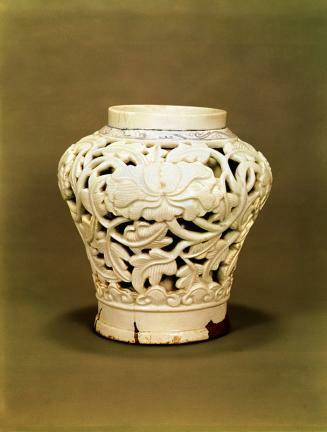 The peony flowers in full bloom, which are carved through the whole surface of this jar, look very realistic. The shape is that of simple beauty of elegance and refinement. Judging from the method of glazing in pale-blue on this white porcelain, it is presumed that it was produced from the firing kiln site in Gwangju, Gyeonggi-do, in the late 18th century during the Joseon Dynasty. Considering that such patterns of peony blossoms and water waves used to be carved on a variety of pen-stands or the flower vases during the period, this piece of work seems to have been made in the second half of the 18th century.